Investors won't have to play a funeral dirge for death care industry specialist Carriage Services as it said Tuesday it will pay a regular quarterly dividend of $0.025 per share on June 3 to the holders of record at the close of business on May 16. This keeps the quarterly payout steady. Carriage Services operates 167 funeral homes in 26 states and 33 cemeteries in 12 states. The most recent dividend payment equates to a $0.10-per-share annual dividend yielding 0.6% based on the closing price of Carriage Services stock on April 30. 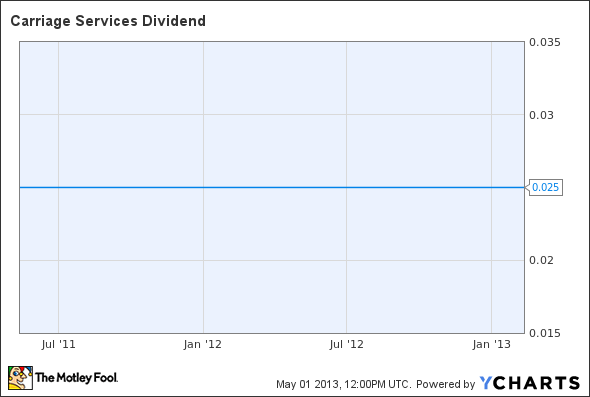 CSV Dividend data by YCharts. The article Carriage Services Keeps Quarterly Dividend Steady originally appeared on Fool.com.